More déja vu than vintage, Singer's latest novel combines familiar Singer themes of moral corruption, Polish life before the wars, and seductive women--all in a story with lofty intentions and a plot that's seen better days. Impotent with grief at the sudden death of his 17-year-old son Arturo, Max Brabander returns in 1906 to his native Warsaw in search of healing and sexual stimulation. A petty crook in his youth, Max had emigrated to Argentina, where he had married, become rich, and grown more or less respectable. Now, vowing to visit his parents' graves in a nearby town, he is nonetheless unable to leave the distractions and temptations of Warsaw. His old underworld neighborhood in the Jewish quarter is changing, but not for the better: corruption is rife, and even the motives of the daughter of the good rabbi in accepting Max's foolhardy proposal of marriage are those of self-interest rather than love. Max is as corrupt as the city he is visiting; and though he recalls with guilt his early religious upbringing, he is too busy pursuing and seducing women to practice piety. But in Reyzl, a procuress and mistress of a local gang-leader, Max meets his moral equivalent--and nemesis. And his discovery that she has been using him leads inevitably to violence and an end that has haunted Max's dreams for years. 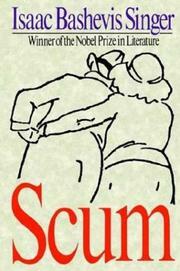 His fate as "scum" was seemingly ordained. Marvellous descriptions of Warsaw life, both in the Jewish quarter and elsewhere, do much to redeem the triteness of a tale predictable in its telling and its outcome: not Singer's best.